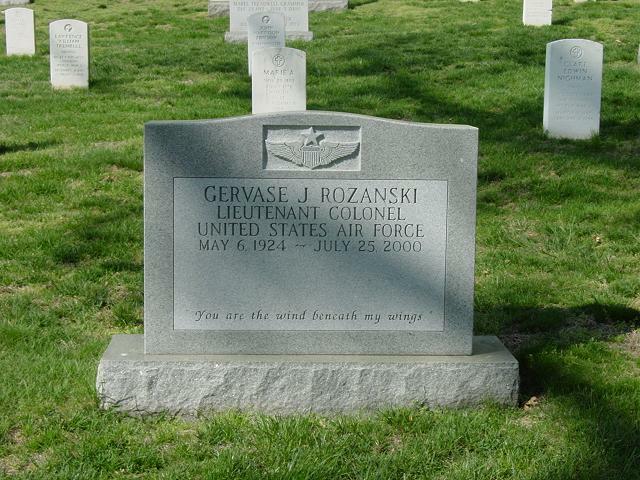 Lieutenant Colonel Gervase Joseph Rozanski, United States Air Force (Ret.) of Falcons Landing Retirement Community died July 25, 2001, at Johnsons Center at Falcons Landing, Virginia. Born May 6, 1924 in Philadelphia, he served from 1944 to 1946 with the U.S. Air Force in the Rhineland, Central Europe and Ardennes campaigns as a pilot of a B-52 bomber. He recieved European, African, Middle Eastern Campaign Medal, Air medal with eight Oak Leaf Clusters, the American Campaign Medal, World War II Victory Medal and the Army of Occupation Medal. He was also a sports photographer for the Philadelphia Inquirer. He remained with the Air Force Reserve until 1971. Survivors include his wife, Eugenia A. Rozanski; a brother, Dennis Rozanski of Philadelphia; a niece, Stephanie Lovett; and a newphew, Dennis Rozanski Jr.
Services with military honors were scheduled for 3:30 p.m. Thursday, Aug. 3 at Arlington National Cemetery. Friends are requested to gather at the Administration Office at 2:30 p.m. The family requests that expressions of sympathy take the form of contributions to the Hospice of Northern Virginia, P.O. Box 1576, Merrifield, Va.
22116-1576, or the Air Force Benevolent Association, c/o Falcons Landing Retirement Association, 20540 Falcons Landing Circle, Potomac Falls, Va. 20165. Arrangements are by Loudoun Funeral Chapel.